I arrived in Bali this morning with Ben Swart and Elsie Bezuidenhout, the remainder of the Mountain Trip 2009 Carstensz Expedition. We are all happy to be heading home after a long, but ultimately successful trip. 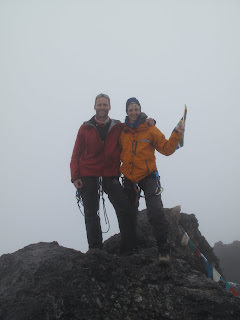 I had a beautiful 2nd summit day with Ben and Elsie, after a snowy 1st summit with Bill H. and Ephi G. I can't emphasize enough how hard it is to keep focused on climbing Carstensz when everything seems to conspire against getting to the mountain. Everyone showed a lot of patience and determination just to get to the mountain, and it payed off. We all had our moments of melting down a bit, but ultimately we all got the job done. I'll do a bit more of a post trip report when I return back to the states in a few days, but for now I'm off for a surf and I'm going to try not to think about helicopters for a while. Beautiful image that you have posted in blog.I love to read your blog site and the way you have described about the Carstensz Pyramid.